With Easter just around the corner try this fun version of "French Bread" shaped into a Bunny. Cut out the belly of the bunny and fill with your favorite dip, serve along a vegetable tray and extra bread for dipping. My recipe is so close the Anneliese's Recipe, however for convenience sake I will post my version here. I doubled the recipe (except the yeast amount) to have extra bread on hand for dipping. Mix all the dry ingredients together, including the dry quick rise yeast, holding back about 1 cup of flour. Add the oil and water in the center slowly incorporating the dry ingredients with the wet. Knead together til a soft dough that is no longer sticky using a bit of the extra flour as needed to make it smooth and elastic. 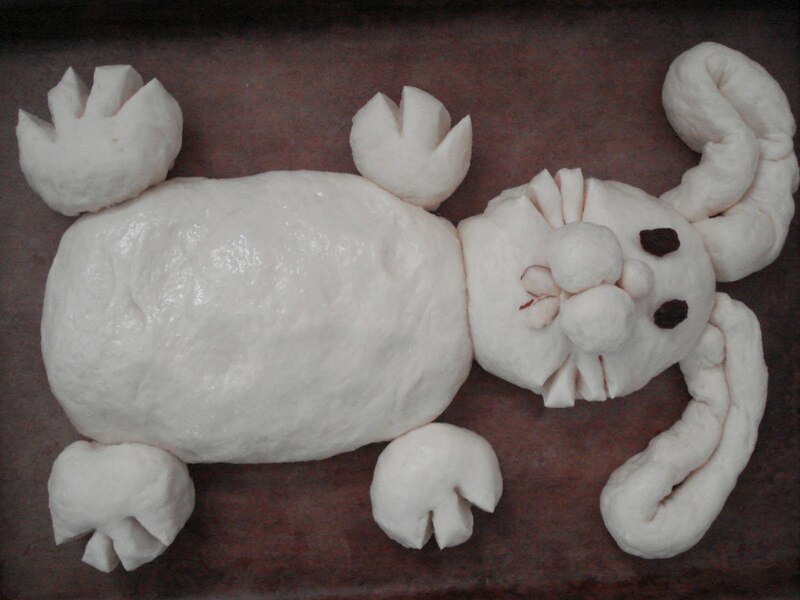 Divide the dough into the parts for the bunny like the picture. There is no exact size, just big enough to fit you baking sheet. Use two raisins for the eyes, two almond slices for the teeth, and cut in the whiskers and into the paws with a sharp knife or kitchen shears. Let rise on for 30-40 minutes, covered with a tea towel. 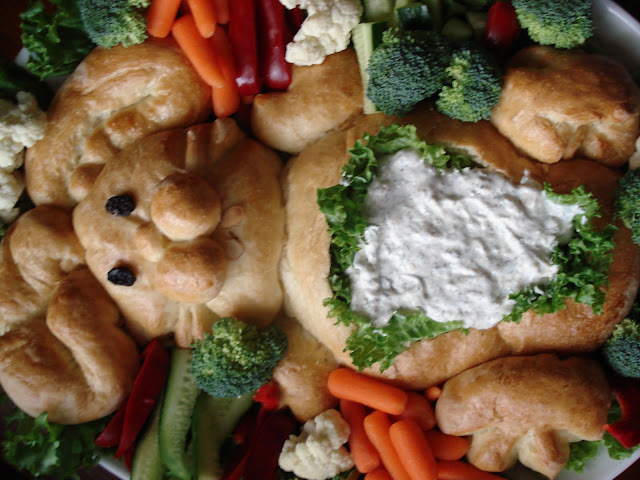 Place the finished and cooled "bunny" onto a platter lined with lettuce leaves. Surround with a variety of cut vegetables. Cut out a whole in the tummy of the bunny and scoop out the bread saving it for dipping. Fill with you favorite dip. Serve extra bread along side for dipping as well. So cute - my niece makes one very similar to this. She uses 2 loaves of frozen bread dough which works well too. How cute Charlotte!! Great idea for a center piece when serving veggies and dip. Will definitely try this recipe. This is the cutest idea!!! I never would have imagined doing such a thing. I'm definitely making this with my kids to take to Grandma's house for Easter! ALL the kids will love it! Thanks so much for sharing. Absolutely adorable! What a fun idea. When my daughter was little, we did a version of this with Hot Cross Bun dough. She still remembers doing this and talks about it with her friends and she's a grown woman. I imagine it will become a tradition with her family someday. Love this idea! When you say double the recipe, do you mean that the recipe is already double the way you wrote it out or do I double the above recipe. For example: 4 tablespoons of sugar instead of 2? Thanks in advance! The recipe given is a single recipe. I doubled the recipe so it would be 4 Tablespoons of sugar instead of 2.